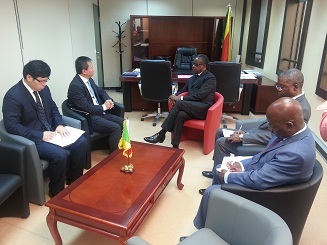 On May 2, 2017, honourable Alain AKOUALA ATIPAULT, Minister of special economic zones and His Excellency Xia Huang, Ambassador of China in Congo, talked about the next stage of the project on the special economic zone of Pointe Noire after the two houses of the parliament adopted the law on special economic zones in Congo. «It is time for us to look at the schedule and the steps to follow in the months to come. I think we are going to continue to work together to make things move and stick to the deadlines despite elections which are looming around. At the end of the meeting, His Excellency Xia Huang also stressed the need for both parties to work closely for the completion of the project. Before the end of the year, other Chinese missions will come to Congo. We will work on the site of the project in Pointe Noire, he said. Minister Alain AKOUALA ATIPAULT said that the adoption of the law on special economic zones by the parliament made things go ahead regarding the zones that the government is planning to create across the country, specially in Pointe Noire, Brazzaville, Oyo-Ollombo and Ouesso. As regard the special economic zone of Pointe Noire, he said that « the next step is also scheduled for the end of May. We will then get all the conclusions of the feasibility study undertaken by the Chinese party about the following issues : the development plan, the type of industries which are going to be built in Pointe Noire and when the works are going to start». In the days to come, around twenty young Congolese people will go for a training to the economic zone of Suhzou in China. The project will bring a strong added value to the Congolese economy which so far depends on oil revenues. According to the Congolese Government, it will generate around 100,000 direct and indirects jobs.